June 22 - Saints John Fisher, Bishop and Martyr and Thomas More, Martyr - Optional Memorial - My Catholic Life! In 1526 a German painter named Hans Holbein could not find work in Basel, Switzerland. The Reformation had come to town. It shattered the stained glass, burned the wooden statues, and sliced up the oil paintings. Protestants don’t do great art. There were no more commissions. So Holbein went north, to Catholic England, in search of wealthy patrons for his craft. On his way, he passed through the Netherlands to procure letters of introduction from the great humanist Desiderius Erasmus. Erasmus was a friend of Sir Thomas More, an English humanist of the highest caliber. And thus it came to pass that one fine day in England in 1527 Thomas More sat patiently while Holbein’s brush worked its magic. Holbein’s extraordinary portrait of Thomas More captures the man for all seasons, as one contemporary called More, at the pinnacle of his powers. More’s head and torso fill the frame. There is no need for context, landscape, or a complex backdrop. More’s mind is what matters. He is what matters. Nothing else. The shimmering velvet of his robes, the weighty gold chain of office resting on his shoulders, the detailed rose badge of the House of Tudor lying on his chest, all tell the viewer – this is not a frivolous man. He serves the King. His work is consequential. He also wears a ring. He is married and has children. He dons a cap. It is England and he is cold. His stubble is visible. He is tired from overwork and did not have time to shave. He holds a small slip of paper. Perhaps a bribe he rejected. His gaze, slightly off center, is earnest, serious, and calm. It is almost as if he is searching the room, attentive to any threat lurking behind the painter. He is watchful. The entirety of the work conveys that elusive quality that denotes great art – interior movement. The gears of More’s brain are rotating. His personality has force. The viewer feels it. St. Thomas More was the greatest Englishman of his generation. In a land with a highly educated aristocratic class, his erudition was unequalled. He was a devoted family man who carried out an extensive correspondence with his children and ensured that his daughters were as well educated as his sons. He served the English crown faithfully both at home and abroad. He charmed his many friends with a rich and engaging personality. He published scholarly works and communicated with other humanists of his era. Yet despite all of these accomplishments, the fraught times he lived in eventually overwhelmed him. He could not save his own head. More was a thoughtful and serious Catholic. He refused to bend to the will of King Henry VIII regarding divorce and Henry’s self-appointment as head of the Church in England. For his silence, or lack of explicit support for Henry, More was brought to court, where a perjurer’s words knifed him in the heart. More was condemned to death. The unconquered Thomas More climbed a shaky scaffold on July 6, 1535 and had his head lopped off. This was a favor from the King, who admired More but could not brook his dissent. More had originally been sentenced to a far crueler form of capital punishment, but Henry decreed that his life end with one blow of the axe. His head was stuck on a pole on London bridge for one month afterwards, a trophy to barbarity. More died a martyr to the indissolubility of marriage. Saint John Fisher was an academic who held various high positions at the University of Cambridge, one of the two universities in all of England, eventually becoming its Chancellor for life. He was a Renaissance humanist, like Thomas More, who encouraged the study of Latin, Greek, and Hebrew. He was the personal tutor of Henry VIII when he was a boy, and preached the funeral homily of Henry’s father, Henry VII. John Fisher lived a life of extreme personal austerity, and even placed a human skull on the table during meals to remind himself of his eventual end. He had many of the same qualities as More – great learning, personal uprightness, and academic accomplishments. But easy times don’t make martyrs. When King Henry wanted to annul his marriage to Catherine of Aragon, Fisher became her most ardent supporter. He openly stated in court that he would die for the indissolubility of marriage, thus incurring the lasting wrath of his former pupil Henry. All the bishops of England, save Fisher and two others, lost their courage and acquiesced, without a fight, to Henry VIII’s take over of the Catholic Church in England. Their weakness brought to a sudden, crashing, end a thousand years of Catholicism in England. The faith endured in some form, of course, but would never be the culture forming force it had been for so many centuries. It is an embarrassment of Catholic history that almost all the bishops of England fell like dominos, one after another, at one slight puff of the breath of King Henry VIII on their cheeks. After various nefarious machinations, John Fisher was imprisoned in the harshest of conditions for over a year, even being deprived the services of a priest. During this time the Pope named him a cardinal, although Henry refused him the ceremonial placing of the red hat on his head. After a brief trial with the usual perjury Cardinal John Fisher was beheaded on June 22, 1535, a martyr to marriage just like his namesake St. John the Baptist. But there was no silver platter. His head was placed on a pole on London bridge for two weeks, only to be replaced by Thomas More’s head. Saints John Fisher and Thomas More were beatified in 1886 along with fifty four other English martyrs. The two were canonized together in 1935. 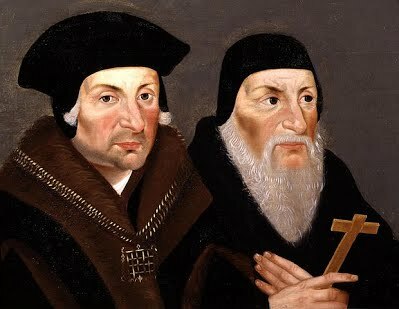 Saints John Fisher and Thomas More, through your intercession give all Catholics courage to resist the pressure to conform to falsehood, to the broad way, to popular opinion. You were both thoughtful and granite like in your resistance. Help us to be likewise when times call for such.